Short Throw Projectors have been taking media viewing to a completely different level by guaranteeing optimum happiness to eyes which otherwise gets restrained when we watch LCD television. Even when we are coupled with the requisite fund, lack of space serves as an obstacle in our way of bringing home a giant-sized LCD TV and that is the void which short throw projectors are trying to fill in. Every projector might look alike to the untrained eye. But these plain-looking boxes come packed with state-of-art technology which you need to understand for gaining the most out of its unbridled potential. After scanning through buying trends and market statistics, we have collated a list of top 10 best short throw projectors which can turn your everyday TV viewing into an unparalleled home theater experience. 100 inches screen from 15 inches distance. Optoma ML750ST 50 inches screen from 32 inches distance. This refers to the figure arrived at by dividing the width of the projected video or image by the distance between the projector and the screen. Best quality short throw projectors have a throw ratio ranging from 0.38 to 0.5. Image clarity enhances during daytime proportionately with the brightness of the projector rated in ANSI lumens. However, a brighter projected image usually tags along with a grayish picture quality and poor black level response. Usually, projectors come with an average lumen rating of 3000. 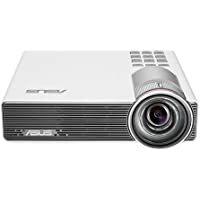 But if you are planning on engaging in screen projections every now and then in a brightly lit room, then it is advisable to opt for short throw projectors having higher lumen ranking. Projectors having “digital light processing” (DLP) bulbs require replacement every now and then. But the LED and laser ones which might be heavier on one’s wallet can go on for decades with minimal maintenance requirement. Projectors come with inbuilt fans and usually create a lot of audible noise dampening a quiet movie scene. This might come off as a big problem if it is placed right next to your seating position as compared to the shelf at a minimum distance of 6 feet from the place where you are seated. This home entertainment projector can deliver 100 inches of vivid and bright pictures from a distance ranging from 15 inches. Weighing at just 4.9 lbs, this portable projector delivers the ultimate cinematic experience and that too at a Full HD resolution of 1080pixels. Coupled with a contrast ratio of 150000:1 and 1000 lumens of brightness, the LG PF1000UW has all that it takes to mesmerize its audience with the perfect movie-watching bliss. Its color balance paves the way for suitably neutral greys at every level ranging from black to white modes. The LG model also does a brilliant job of resisting posterization and maintaining shadow detail even in the clippings which are most vulnerable to similar problems. Its LED light source promises rich and natural colors which maintain its prowess over a stretch of 30000 hours. Thus, you can put your lamp replacement worries at rest for a cool 10 years or so assuming an average daily usage of 8 hours. Its collaboration with premium content providers like Hulu Plus, Netflix, Vudu, and Amazon is bound to spellbound the PF1000UW users with an array of viewing options. Easy navigation gets established courtesy the Magic remote which aids in quick scrolling, toggling between channels and easy search options so that you can spend more time entwined in the visual extravaganza rather than pondering over the navigational aspects. The PF1000UW has an inbuilt Wi-Fi which helps in screen-sharing while using a Windows or Android tablet or smartphone. You can also wirelessly stream sound to a Bluetooth compatible sound system to make the most out of its immersive audio experience. This ultra-short-throw Full HD projector does not require undergoing fancy installation to conjure up a brilliant visual extravaganza. Unlike its peers, the Optoma GT5500+ does not require sprawling space to project video and picture clippings. It can easily create a 100-inch screen even when placed at a distance of just 13 inches from the wall surface making it redundant to bring home a specialty mount. The plug and play device set-up is devoid of any fancy software configuration and comes with a plethora of connectivity options in the form of two HDMI ports supporting MHL, one USB power outlet, one VGA port etc. 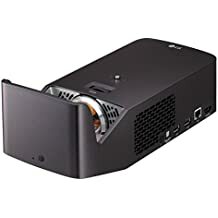 The pass-through connectivity of this projector stands out as its USP and aids in connecting the laptop to the monitor with the projector serving as a medium. The true-to-life color of the gradient of the GT5500+ does not feature any unsightly banding and paves the way for a rich cinematic experience courtesy its 25000:1 contrast ratio. This comes from a great add-on for gamers as the digital environment becomes all the lot more engaging and realistic. The remarkably bright 3500 lumens lamp can lead to crystal clear projection even in a highly illuminated room. You can turn the Optoma GT5500+ into a smart device by simply connecting it to an HDMI dongle such as Google Chromecast, HDCast Pro, Apple TV or Amazon Fire to share photos, stream videos or play games on the big screen at your home. 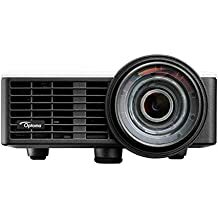 You can now pack in the performance and power of a full-sized projector within the palm of your hand courtesy the ultra-compact Optoma ML750STLED projector which has already carved out its niche amongst road warriors with its ultra-bright image quality. With the razor-sharp focus, the impressive contrast ratio of 20000:1, Rec709 color accuracy, auto keystone and 700 ANSI lumens, the Optoma offering ensures larger than life impact of all your presentations. In spite of weighing less than a pound, the Optoma ML750ST features an incorporated HDCast Pro device for multimedia playback and device mirroring. Its LED light source can run along for a mammoth 20000 hours making it redundant to purchase another lamp anytime soon. The built-in DLP technology brings along complete color accuracy and lightning fast response times. The individual hues of green, red and blue LED modules by the Optoma projectors can conjure up the projected image beautifully without the requirement of a color wheel. You can establish hassle-free connectivity of the ML750ST with a gaming console, laptop, DVD player or PC through the HDMI port. It can also be connected to MHL compatible mobile devices for reaping the benefits of screen mirroring. All the above-mentioned features make the Optoma short throw projector an ideal option for viewing photos and files stored on our mobile device. The premium looking BenQ packs in a DLP chip supporting Full HD resolution of 1080p. This dynamic model paves the way for 2200 lumens of image brightness with its color wheel spinning at 4x speed of 60Hz and 6x speed of 50Hz. 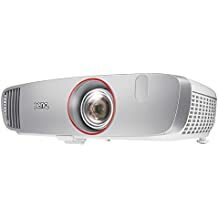 Weighing under eight pounds, the BenQ HT2150ST can surely be branded as a fairly portable projector having CinematicColor technology which brings along enhanced and accurate image quality. High native ANSI contrast ratio, 6x speed RGB color wheel and HDTV standard color coverage paves the way for true to life detailing encompassing a rich color gamut. 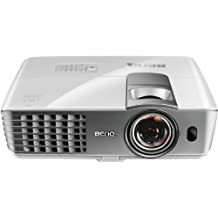 The BenQ HT2150ST projector can project stunning 100” pictures from a range of just 4.9 feet to bring along big-screen entertainment within the comfort of your home. Its microsecond DMD response time and 16.67ms low input lag keep image lag and motion blur at bay for ensuring and ultra-smooth gaming experience. 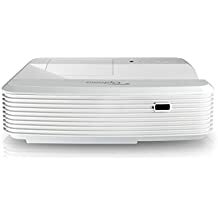 TheCinemaMaster Audio Enhancer feature of the BenQ short throw projector having a 20-watt stereo speaker fills in the room with bombastic sound waves which can boost up treble and bass dramatically. The dual modes of the HT2150ST fine tunes both saturation and contrast of images in accordance with ambient lighting. The Game Bright Mode is for well-lit rooms whereas the Game Mode is for darker rooms. The screen brightness adjusts automatically with the natural environmental light to bring out details in its truest sense. This unique short throw projector blends in the best of high-level video processing and video-gaming which are two such features which usually do not sync well with each other. The relatively lightweight white hued projector radiates a premium aura courtesy its artfully domed lens cowling and polished top edge. The remote control which comes along with the GT1080Darbee features tactile and well-organized buttons set on a backlit surface which aids in using the same even in dim-lit scenarios. It promises crystal-clear imagery and spectacular gaming visuals with the collaborative forces of a 28000:1 contrast ratio, 3000 lumens of brightness and Full HD 1080p resolution. Enhanced gaming mode of the GT1080Darbee can help you stand ahead of your competitors with its best-in-class response time and the supreme energy efficiency promises a gigantic 8000 hours of no-strings-attached lamp life. Its next-generation DarbeeVision Image Processor accentuates image quality with an extraordinary level of depth, detailing, object separation and lighting. This Optoma model can mesmerize an audience with its striking 3D content display by establishing HDMI 1.4a connectivity across all 3D broadcast, Blu-ray players, and latest gaming consoles. With a throw ratio of .49, which can cough up 100” image from within 4 feet of the projection surface, the GT1080Darbee is tailor-made for movie and gaming buffs who have limited space options. 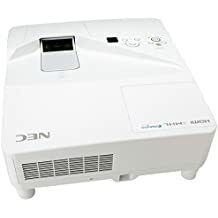 The super portable and compact P3B LED projector sporting a white and silver metallic body is flanked by a cooling fan on the right and projection lens in the front. Users can adjust the screen sharpness by rotating the wheel housed at the top of the device. The P3B can deliver an ultra-sharp output of 1280×800 pixels, 100% NTSC color gamut, 800 lumens of screen brightness and 30000 hours of LED lifespan. It can project a maximum of 60-inch output when placed at a distance of 1m from the surface of projection making the P3B suitable mostly for small sized rooms. This lightweight palm-sized beauty has already created a brand of its own with the best-in-class short-throw ratio of 1:1. Its auto keystone correction functionality helps in aligning the output correctly regardless of the projector’s resting angle. The easy to set-up Asus P3B comes loaded with an inbuilt 2W speaker to offer a comprehensive audio experience in collaboration with Asus SonicMaster Technology. The 12000mAh internal battery keeps the device running for a stretch of 3 hours before running out of juice and can also charge up the device instantaneously. The projector also doubles as a power bank for charging other devices such as tablets and smartphones even when running. This versatile projector having a contrast ratio of 4000:1 can render bright and large images even with a substantial amount of ambient light already in the picture. High contrast paves the way for razor-sharp detailing and wider ranged color palette. Coupled with 2500 ANSI lumens of brightness, the BenQ MW814ST can fill in a 2.4m screen from a distance of just 1m. 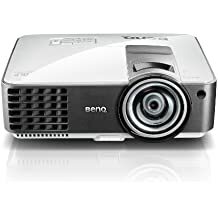 BenQ MW814ST provides the audience with more floor space and fewer chances of interruptions when you end up wrongly interfering with the beam. Its international auto switching property supporting 28 languages can project video in PAL, NTSC and SECAM standards. The MW814ST mesmerizes with vivid and brilliant imagery courtesy its DLP DMD imaging panel featuring Brilliant Color which is immune to color decay. You can engage in realistic 3D viewing without leaving the comfort of your home by the aid of million microscopic mirrors which operate at the super-fast speed to project one image for each eye. Compared to 4:3 projectors, the WXGA widescreen projection of BenQ enhances the comprehensive viewing surface by 30% making it an absolute favorite for being projected on the blackboards and whiteboards in classrooms. You can seek the help of the built-in 10W speaker to take your boardroom presentations a notch higher coupled with top quality audio performance. Weighing at just 6.2 pounds, the W1080ST projector can be easily stored away when not in use. Its back panel comes loaded with a bevy of connectivity options including two HDMI 1.4a ports supporting both 2D as well as 3D for being connected directly with FIOS boxes, cables, and Blu-ray players. Other image inputs come in the form of a VGA port, an S-video port and 3 RCA connectors meant for component video. The 1.2x manual zoom offers supreme flexibility irrespective of the image size. Its color brightness is measured at 77-79% of its white brightness in accordance with the color mode which translates to minimal difference in between a solid white screen and apparent brightness of a color image. The strikingly high ratio between color and white brightness paves the way for vibrant color quality. The BenQ W1080ST is an absolute master when it comes to handling skin tones. Thus, you can expect next to nil pasteurization or motion artifacts. 3D viewing gets accentuated by an appropriate sense of depth, good color quality, and no crosstalk. You might also feel the need for an external stereo sound system as the 10-watt mono speaker of the W1080ST delivers moderate audio quality. This easy to use short throw projector featuring ultra-bright widescreen functionalities can be the perfect option for delivering engaging classroom as well as boardroom lectures. 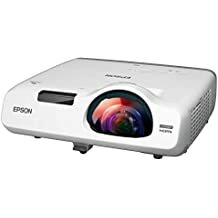 Powered by its three-chip LCD projector, the Epson 535W guarantees zero rainbow artifacts which often pose as a problem area for the single-chip DLP ones. Its back panel comes packed with numerous connectivity options such as a VGA port, an HDMI port, and a composite video port. You can even connect a document camera or read files directly from the USB memory key using its USB Type A port and S-Video port. Its in-built USB Type B port aids in direct USB display whereas the LAN port assists in sending audio or video data and controlling the projector over the network. Featuring 3400 lumens of brightness and 3 times brighter colors in comparison to its peers, the Epson 535W brings along well saturated and eye-catching image quality at all the preset modes. Commendable color balance paves the way for suitably neutral greys at every level ranging from black to white. Its 16-watt mono speaker delivers outstanding sound quality which can easily fill in a mid-sized room with its audio waves. The Epson 535W can project images with minimal glare or shadows and utilizes low-cost yet long-lasting lamps thus further bringing down its affordability parameter. This powerful data projector tailor-made for business and educational usage can be the perfect option for catering to midsized venues. This LCD-based data projector having rounded corners is not meant for being carried around given its heavyweight 12 pounds’ architecture. The NP-UM361X does not show any sign of degradation while standing up to a considerable quantum of ambient light by throwing in a bright image quality. Its 20-watt speaker can encompass a moderately sized conference room in brilliant soundwaves of crystal clear audio. The video quality suitable for midlength clips is also worth appreciation. However, it might lead to moderate hatching in certain frames as an artifact of pixilation. Its well-saturated and bright display is devoid of rainbow artifacts which are often categorized with the DLP models. The variable audio-out empowers the remote control by adjusting the volume of self-powered external speakers which can be connected to the projector for the enhanced audio experience. Audio-out stays active even in the standby mode allowing the passage of last used input to the self-powered audio devices. The virtual remote control helps indirectly controlling the projector from a computer without the requirement of additional control cables. It becomes imperative to assess the likely usage scenarios and conditions before proceeding with the purchase decision of a short throw projector. Make sure to pick up a compact model which can be packed away easily if your requirement changes its geo-location every now and then. A model having lower throw ratio is best suited for delivering best image quality even in small and intimate spaces. You should stick to the one which will be the best-suited to fulfill your requirements after assessing all the technical features one by one. But make sure that you don’t end up falling prey to showy features or technical jargons which you can circumvent by carrying out a prior analysis of your individual requirements without which you are bound to end up getting confused. *All prices mentioned are at the time of publishing. NOTE : CARTBIG.COM IS A PARTICIPANT IN THE AMAZON SERVICES LLC ASSOCIATES PROGRAM, AN AFFILIATE ADVERTISING PROGRAM DESIGNED TO PROVIDE A MEANS FOR SITES TO EARN ADVERTISING FEES BY ADVERTISING. Note: Amazon and the Amazon logo are trademarks of Amazon.com, Inc. or its affiliates.